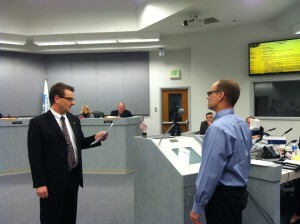 The Port Orchard City Council formalized its appointment of Scott Diener on Tuesday with a unanimous vote. Diener, who fills the vacant district 3 seat, was immediately sworn in. He took his seat and served with the council for the remainder of the meeting. Diener said the city was “entering a new chapter” of its history. The council interviewed candidates on Thursday and held two (closed) executive sessions before reaching a consensus Monday. All candidates were notified of the decision before Tuesday’s meeting. On Wednesday, I interviewed Fred Chang, administrator of the Port Orchard Facebook group, about a face-to-face meet-and-greet of group members on Saturday at the Port Orchard Public Market. The same day, a flap within the group unrelated to the meet-and-greet or the interview was stirring. Bruce Beckman set off a lengthy thread by posting a comment in the main group about a spin-off that Fred started in December called Port Orchard Religious Rants and Raves group. Fred mentioned the group during our interview, saying the idea was to give group members a place to discuss religion. Early in the religious group’s existence, Fred turned active administration over to another member and didn’t pay much attention to the discussion thereafter, he said. What Fred hadn’t noticed was the snarky tone — my description — of the more recent posts, that some members objected to. Chang, in a separate post that showed a screen shot of Bruce’s comments, said he disagreed with Bruce’s characterization of the religious discussion group. Fred added that had he seen posts that appeared to be mocking, he would have removed them. Chang on Friday told me he had a private message conversation with Kathryn Simpson, who was also unhappy with Fred about his involvement with the group. On Thursday, Chang took the group down. A separate group with the same name, administered by someone else, appeared shortly afterward. I’m pursuing the issue here not to settle whether the group was mocking of people of faith but to address public records issues that Bruce alluded to in his post. Should a city resident who is also a city councilman maintain an active private profile on Facebook? Does the use of the term “Port Orchard” in the title of a group administered by someone who is a city councilman constitute a public record? First, let’s note that other Port Orchard City Council members have Facebook pages. Like Chang’s account, the content is mostly about sunsets, pets and the like, nothing racy, very little city related. Cindy Lucarelli has made a couple of upbeat posts about city cleanup day and the like. According to Pat Mason, legal consultant for the Municipal Resources Service Center, there is nothing that precludes elected officials having personal social media accounts or private devices, but as we learned from Hillary Clinton, issues arise when you conduct public business on a private account. Mason says there’s nothing that prohibits this, “Our concern would be, if they do, are those records being retained?” Because, as in the case on Bainbridge Island, people can make public records requests for those documents, and if the city or county or water district drags its feet in any way (as defined under public records laws) it runs the risk of a lawsuit. Bainbridge ended up settling a public records suit for $500,000 in late 2014. In short, according to Mason, elected officials can conduct public business on private accounts, but they had better be able to quickly produce those records. Chang occasionally will give information about the city on Facebook, such as the date of a city council meeting. When he does, he takes a screenshot and sends it to his city email to create a record. Chang, as far as I can tell, stayed out of a recent heated discussion about city zoning regulations and one business owner’s display of a large American flag. He said he purposely avoids posting in discussions where it might be construed that he was making a position statement on behalf of the city. Mason concurs. “They don’t give up their free speech rights,” he said. But the issue is far from cut and dried. The sheer volume of material to be sifted through and the possibility of deleted posts could raise questions about whether a search for public records has been satisfied. The rules are being hashed out in the courts, as on Bainbridge and elsewhere. Some jurisdictions limit the use of private accounts for public business. Port Orchard this year implemented software that allows elected officials access to their city email on private devices. And the city has a policy saying social media sites of city departments are to be one-way only for giving out information not for engaging in public debate. But there is nothing in the city policy that speaks to elected officials’ private use of social media. As it stands now there is some degree of conflict between privacy rights of public officials and public records requests, Mason said. Should elected officials have personal social media accounts? Port Orchard Police Chief Al Townsend is a finalist for the vacant Poulsbo police chief position. The city of Poulsbo announced on Tuesday that Townsend’s name had been added to a shortlist of five other finalists. Townsend applied for the job and was added to the finalists list by Poulsbo Mayor Becky Erickson, according to a news release from the city. Townsend has been Port Orchard’s police chief since 1999. The announcement of his application to Poulsbo comes less than a month after the chief publicly commented on recent tension between Port Orchard’s Mayor Tim Matthes and the city council. Townsend, referring to the recent voluntary departure of the city’s development director, also noted stress within the staff. James Weaver, who joined the city in 2008, took a job in January with the city of Bainbridge Island for comparable pay and less responsibility. Matthes on Tuesday issued a press release on the news Townsend is looking for a new position. The city meanwhile is conducting a wide-ranging search to replace Weaver. Associate Planner Tom Bonsell is serving as acting development director in the interim. So begins a letter the Kitsap Sun recently received from bird lover Ellen Bankus of Port Orchard. Bankus, who owns a number of birds, went on to describe the mishap of one “no name” parakeet who got out of his cage in the bedroom, made a beeline for the laundry room and somehow got stuck on the floor behind the water heater. The space behind the appliance was so confined, that even the tiny bird could not find a way out. If this were one of those old time serial movies, this is where we’d fade to black, leaving Tweety tied to the railroad tracks. But look, up in the sky. It’s a bird; it’s a plane. No, it’s Port Orchard City Councilman Fred Olin to the rescue. 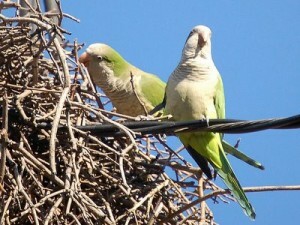 Bankus called Olin, remembering his militant advocacy for the city’s Quaker parrots in 2005. This was before my time on the South Kitsap beat, but apparently Olin’s involvement in city government sprang from his interest in a group of parrots that had escaped during transport to a local pet store in 2002 and taken up residence in a cell phone tower near South Kitsap High School. The council in 2005 OK’d the extension of the tower, but on the advice of the state Department of Fish & Wildlife, required that the tower owner remove the large nest of sticks and trap the birds. The DFW said the birds could cause problems for native wildlife and there were concerns about fire in the tower. Survive and thrive. Olin estimates at one time there were up to 30 parrots cavorting and entertaining residents in a wide vicinity of the tower. He took it on himself to circulate a petition to save the parrots and allow them to remain free, eventually gathering 1,800 signatures. “I am not a bird person. I am not a parrot person. I’m just going, ‘It’s not right to do that,'” Olin said. The outcry about the parrots gathered media attention, with signatures on the online petition coming from 18 foreign countries, 45 states and 61 Washington state communities. The council asked the DFW to reconsider requiring that the parrots be removed. The DFW pressed its case, however, and attempts to trap and remove the birds went forward in July 2005 … not without resistance from Olin. When sticks from the nest were removed from the tower, they just happened to show up in the back of Olin’s pickup truck, which he planned to park in the area in hopes of providing the birds a new accommodation. None of the birds were captured on the first day. What wasn’t reported at the time, and what Olin divulged to me is that on the evening of the first capture attempt, he went to the local hardware store and got pounds of millet, which he distributed on rooftops far and wide in the dark of night. “The next day the trapper came back, there wasn’t a bird in sight. They were all over town,” Olin said, with an audible smirk. Don’t think a smirk can be audible? Trust me, Olin was pleased as punch with himself. Later, when Clearwire applied to put antennae up on another tower, the council ditched a proposed condition that any nesting birds be removed. Olin was inspired by his civic success to run for city council in 2007. He served 2008 through 2011. Jack Grable, 83, of Port Orchard, a former city councilman, died Sept. 8 at his home. Grable, a World War II Army veteran, was named Port Orchard Man of the Year 2002. He was a lifetime member of the Masonic Lodge in Port Orchard, lifetime member of the Port Orchard V.F.W. Post 2669 and a volunteer fire fighter for 26 ½ years in Port Orchard. His interests included welding, volunteer work, walking their dogs, and working on Fathoms o’ Fun floats. Visit his online memorial at Rill’s Life Tribute Center.